Connect with local non-profits in a casual setting. 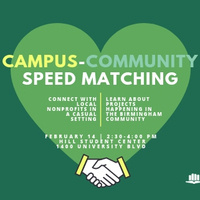 Students can learn about potential internships and community service opportunities in the Birmingham community. UAB faculty and staff will have the opportunity to learn about ways to incorporate service learning into their classes.